Hi there I found this doll in a huge pile of trash so I brought her home. 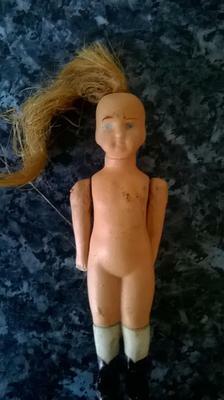 My friends have been scaring me saying its a spirit doll with the human hair of a dead person. So I am getting a bit spooked especially after I gave a slight pull on the hair and lots came out of the body. Just think its an old one and not possessed. It is ceramic I think.